The Panasonic Cell IQ DH Sterilization CO2 Incubator delivers an optimal cell growth environment, tight digital CO2 control and dependable, repeatable use. 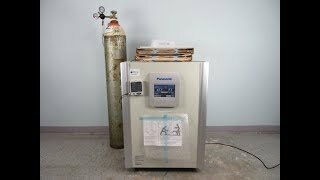 This 5.8cu ft CO2 incubator features dual heat sterilization, that uses both heat from the cultivation heaters as well a secondary system to create an energy efficient, high heat 180°C sterilization routine. The coved corner interior of this CO2 incubator is copper infused stainless steel for an antimicrobial surface that’s easy to clean and maintain and is partnered with a safe cell UV function that decontaminates the circulated air. The melamine foam insulation of this lab incubator helps to retain temperatures, with a range of +5 above ambient to +50, and just ± 0.1 fluctuation. The Cell IQ is microprocessor controlled with an easy to read, full color LCD touchscreen that shows internal conditions, and alerts and can be navigated with gloved hands. This 2018 Panasonic Cell IQ DH Sterilization CO2 Incubator is new in box and has been tested by our service depart for quality control. All of our lab equipment comes backed with our standard warranty. Should you have any questions please don't hesitate to contact us.